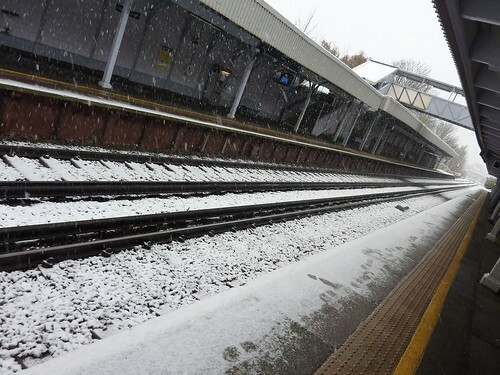 #UKSNOW: Snow. It’s a bugger. Last night I was getting excited about a light dusting of snow in London. It wasn’t long after my wishes had been granted that the childish wore off and the reality hit me once more. 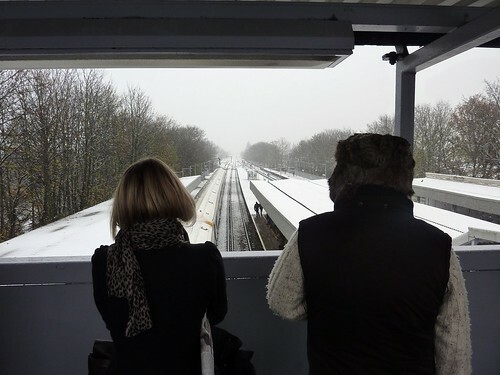 Us Brits … Actually no, us Londoners are hopeless when it comes to snow. I could see it on the faces of some of the people on the station. A look of weary resignation flashed across most of their faces like this post weather was the straw which would (if it hadn’t already) break the camel’s back. Hats, gloves and scarves which hadn’t seen the light of day for months now made their early debut for the 2010/2011 winter season. 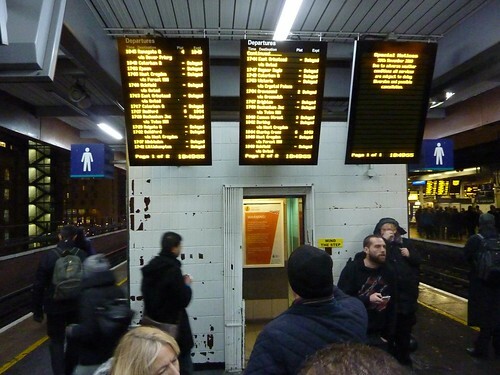 And of course, all of this accompanied by the inevitable messages of gloom from South East Trains. 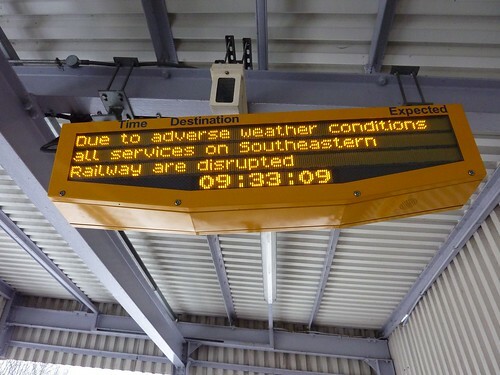 Quite how they could describe a light dusting of snow as ‘adverse weather conditions’ when I’m fairly certain the beginning of the line would have seen no worse than our station, I don’t know. Remembering the considerably more snowy rural scenes I’d seen on the BBC late last week and the beginning of this one made me squirm. The British seem to have an unfailing ability to latch on to any excuse we can so as to insure ourselves against criticism or complaint. And when we do it we usually dress it up mixing strong yet oblique words like ‘oblique’ with spineless ones like ‘conditions’. And then we’ll make some half-arsed apology for it too. My God. I am that middle England cliche personified. 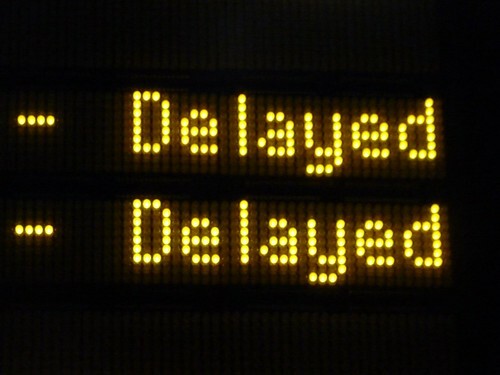 It wasn’t that much better by the time I made my way home. Crowds of people craned their necks up at the display boards, most flashing the dreaded ‘Delayed’ sign. 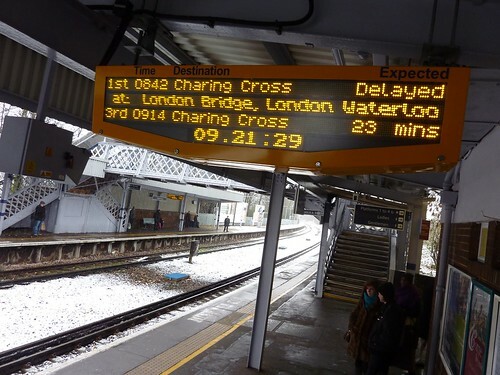 Thank God for the Docklands Light Railway which proudly signposted it was running a good service to all destinations. It’s all rather depressing to see but I totally agree with your comments, us Brits think the world has come to an end after the lightest snowfall. 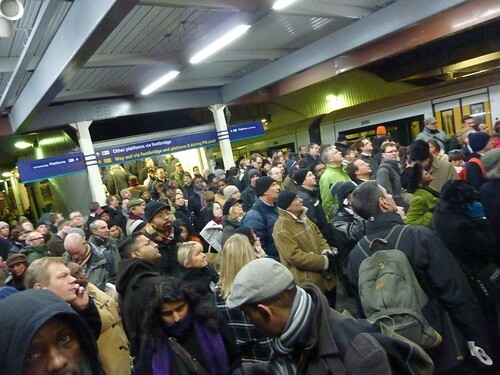 The news is filled with clips of traffic jams, trains waiting at stations or crowds waiting at trainless stations. It all gets too predictable, yet we have winter every year in this country. Our our memories that short?